Figure 5. Jurkat cells, untreated (green) or treated with terfenadine (200 μΜ, 4 hr; blue), were labeled with MCB (100 μΜ, 30 min) and analyzed using direct flow cytometry at an excitation wavelength of 380 nm and an emission wavelength of about 460 nm. Figure 1. Reduced Glutathione Standard was diluted in Tris Assay Buffer and samples were assayed to create a standard curve. This standard curve is for demonstration purposes only; in order to accurately determine glutathione levels users should generate a standard curve for each sample set. Figure 2. 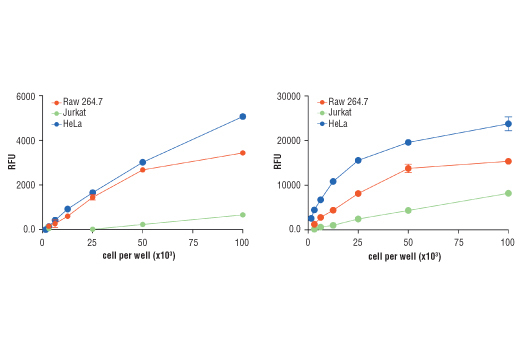 Raw 264.7, HeLa, and Jurkat cells were seeded in 96-well plates at various cell densities. 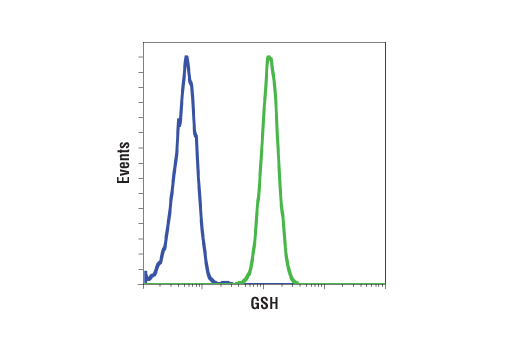 Cellular glutathione levels were determined using the Cellular Glutathione Detection Assay Kit using both cell extracts (upper) and live cells (lower). Figure 3. 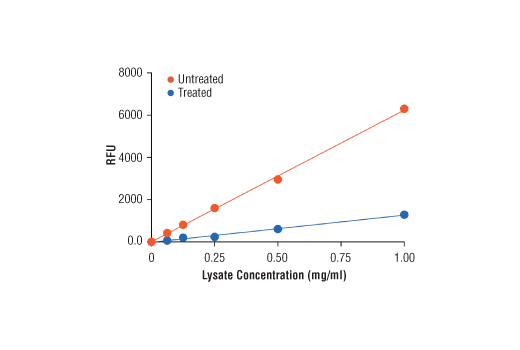 The relationship between the protein concentration of lysates from HeLa Cells, untreated and treated with Staurosporine #9953 (2.0 μΜ), and RFU as determined by the Cellular Glutathione Detection Assay Kit is shown. Figure 4. HeLa cells (4x104 cells/well) were treated with terfenadine (indicated concentrations, 4 hr) and reduced glutathione levels were determined using the Cellular Glutathione Detection Assay Kit. Relative fluorescence units (RFU) were measured using a fluorescent plate reader with an excitation wavelength of 380 nm and an emission wavelength of about 460 nm. Figure 6. Jurkat cells, untreated or terfenadine-treated (200 μΜ, 4 hr), were labeled with MCB (100 μΜ, 30 min) and Propidium Iodide (PI)/RNase Staining Solution #4087 and analyzed under a fluorescent microscope. 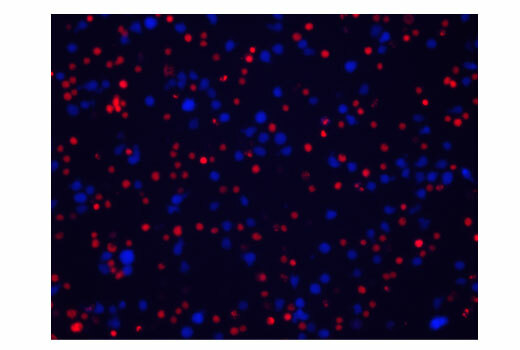 Live cells (untreated) show high reduced-glutathione level (blue) while dead cells (treated) stained with PI (red) due to their compromised plasma membrane. The Cellular Glutathione Detection Assay Kit employs the cell permeable dye monochlorobimane (MCB) to detect reduced glutathione (GSH) in cellular assays. 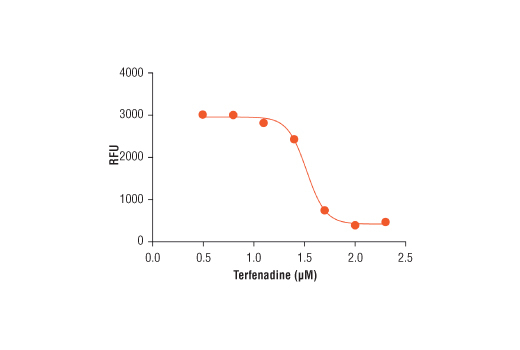 MCB displays a high affinity for reduced glutathione and exhibits a very low fluorescent yield when free in solution. Upon binding to GSH, the dye exhibits a strong blue fluorescence that can be measured at an excitation wavelength of 380 nm and an emission wavelength of 460 nm. Fluorescent intensity correlates with sample GSH level. 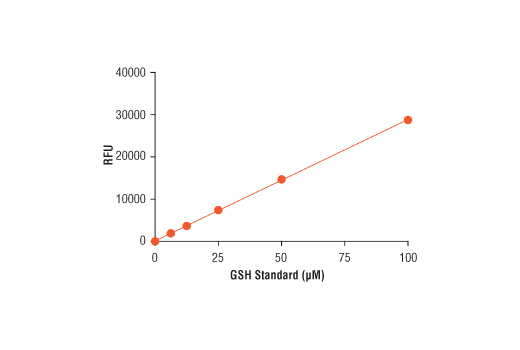 This kit can be used to either label cells directly or to detect GSH level in cell extracts. The assay can be easily applied in high throughput plate-format, flow cytometry, or fluorescent imaging. The Cellular Glutathione Detection Assay Kit is expected to detect the reduced glutathione in cellular assays across all species. The antioxidant glutathione is found in both reduced and oxidized states in cells. Reduced glutathione can play an important role in preventing cellular damage caused by reactive oxygen species, including free radicals and peroxides. Reduced glutathione (GSH) acts as an electron donor in the presence of free radicals and peroxides to become oxidized (GSSG). GSH also participates in redox signaling through the removal of the cellular second messenger H2O2 (1,2). Diminished glutathione levels are observed during the aging process and in oxidative stress-related diseases. The depletion of GSH is necessary for the progression of apoptosis that is mediated by various signaling pathways (3,4). Intracellular GSH levels can be a very useful indicator for overall cell health, proliferation, and death (2). Dickinson, D.A. and Forman, H.J. (2002) Ann N Y Acad Sci 973, 488-504. Pompella, A. et al. (2003) Biochem Pharmacol 66, 1499-503. Franco, R. et al. (2007) J Biol Chem 282, 30452-65. Macho, A. et al. (1997) J Immunol 158, 4612-9.